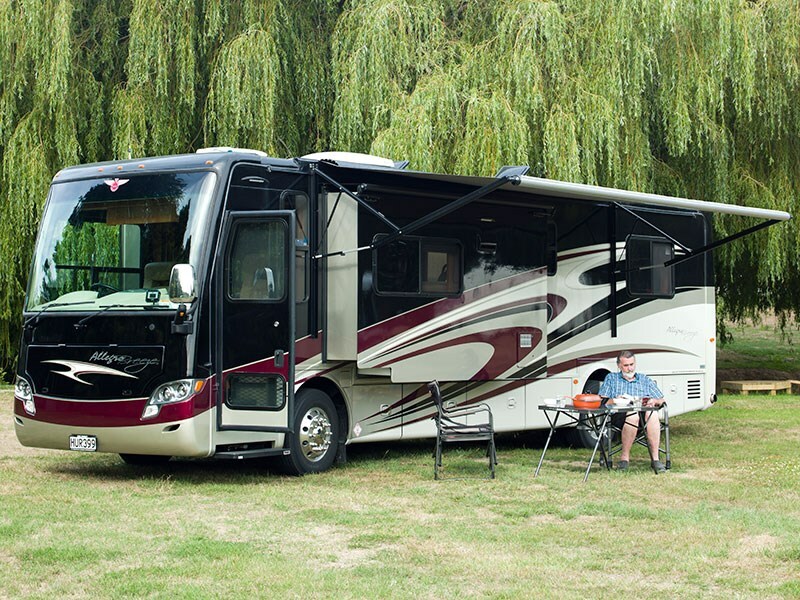 There's a new kid on the block: the new Tiffin Allegro Breeze 32BR from USA Direct. 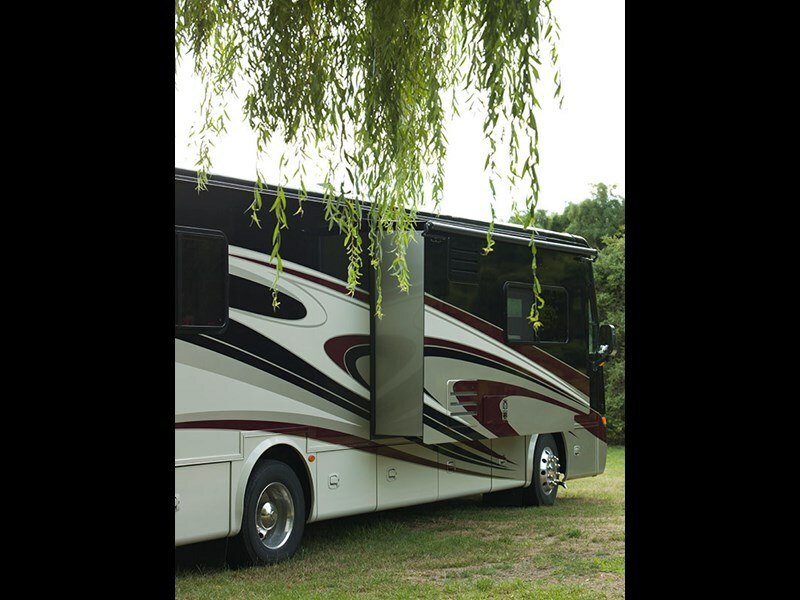 USA Direct is happy to announce the arrival of the new 2015 model of the Allegro Breeze 32BR Class A model from Tiffin Motorhomes. 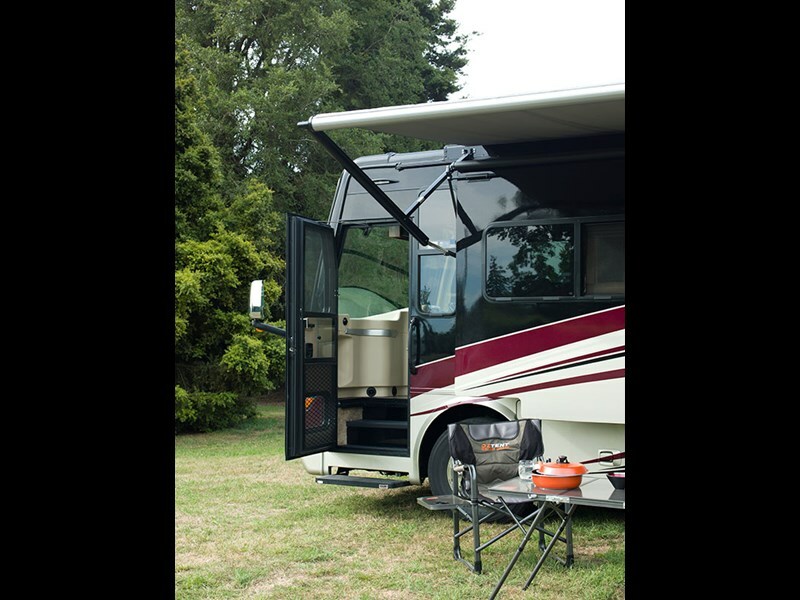 USA Direct is the exclusive New Zealand dealer to offer this motorhome that has been converted to right-hand drive, with the entry door on the left-hand side, wired throughout with 240V New Zealand standard wiring. These double slide-out, diesel pushers are fully New Zealand compliant with New Zealand-sourced appliances, and covered by the factory warranty. The price includes GST, all New Zealand compliance with self-containment certificate, 12 month's registration and on-road costs to a turn-key stage. The huge galley will leave nothing wanting. Included are solid surface countertops with a full tile backsplash and double bowl stainless steel sink. You will be able to cook up a storm with the domestic-sized Dometic whiteware which includes a Dometic 3+1 gas/electric hob with grill oven and three-way, two-door AES fridge/freezer plus a microwave with exterior venting. The generous bathroom features a medicine cabinet skylight in shower with LED light; satin nickel vanity faucet; moulded fibreglass one-piece shower; and a solid surface vanity-top together with safety-wise Fantastic Fan carbon monoxide and gas detectors. 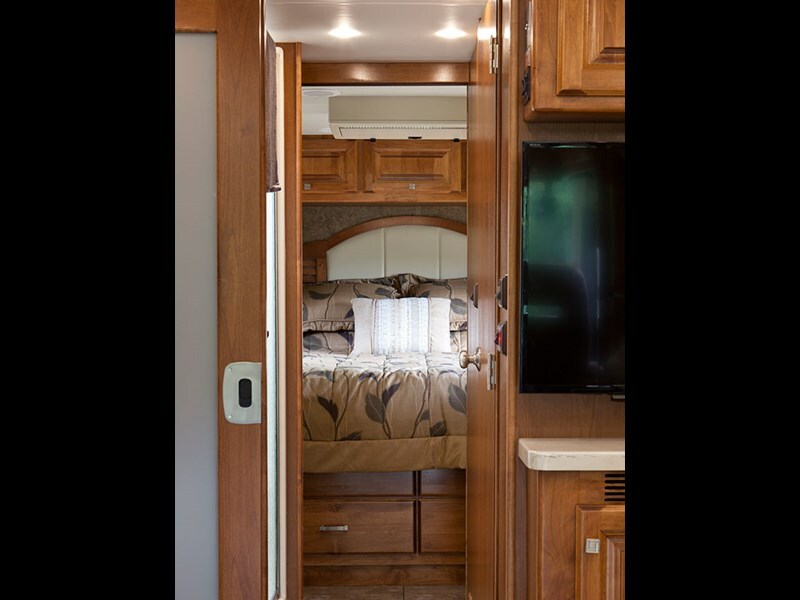 You will enjoy bedroom bliss with the layout and mastery of the Allegro's bedroom with its dual wardrobes with banks of drawers; bed comforter with throw pillows; Jamison memory foam queen mattress and four additional large drawers in the bed pedestal. Sleep easy with solar/privacy shades behind a privacy door with decorative glass panel. And if you want to watch TV in bed, a 22-inch LED screen awaits you. 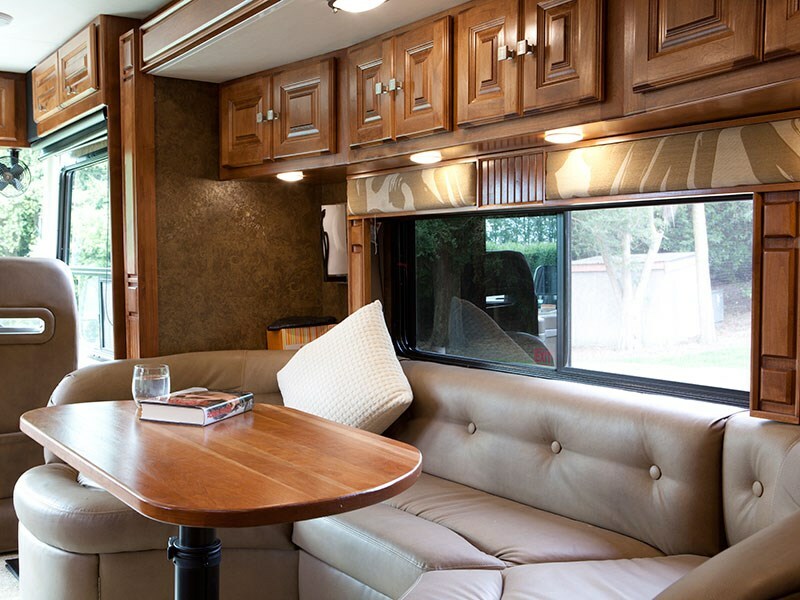 Extra sleeping room is provided by the convivial U-shaped dinette which converts to a bed and the Halo leatherette sofa/sleeper on the driver's side of the vehicle. The total entertainment package includes two Sony 32-inch LED TVs with Sony home theatre surround sound system, plus a Blue-Ray DVD player and an AM/FM tuner. 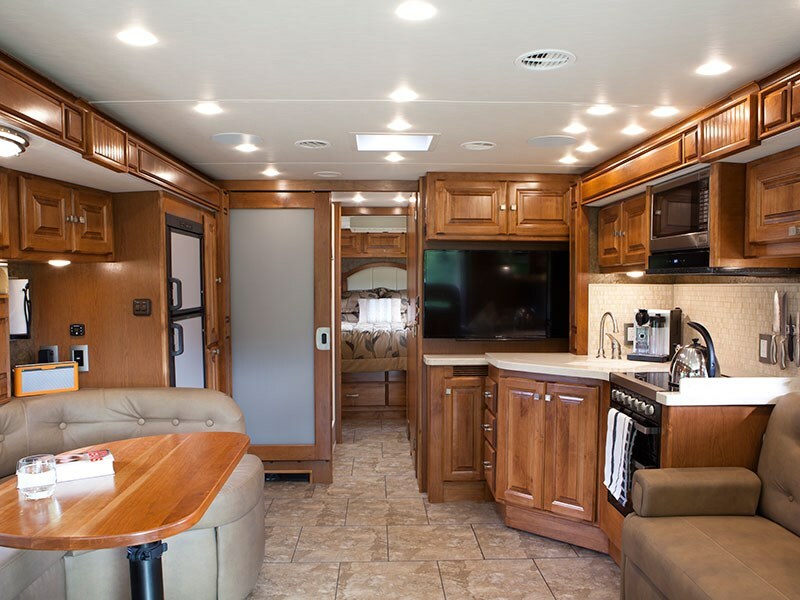 English chestnut cabinetry combines with high gloss raised panel hardwood cabinet doors and Scotchgard treated carpet and fabrics; plus vinyl tile flooring; ball bearing drawer slides. Along with the other rooms in this generously proportioned vehicle, the living room is also enhanced by solar/privacy shades and LED light bulbs. 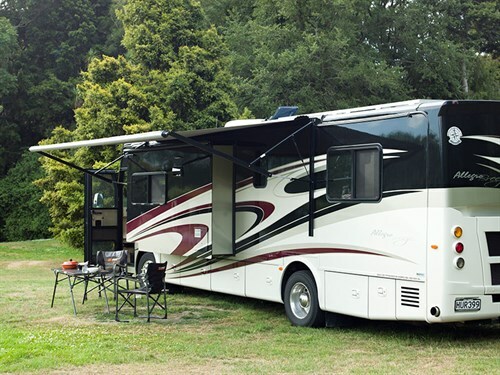 Extras included are a tank level monitor system, smoke detector and diesel space heater together with Apollo megatronic, auto-satellite TV system. The reinforced steel with aluminium structure comes with fibreglass front and rear caps, and a tinted, one-piece windshield and aluminium wheels. Fibreglass walls are gel-coated and contain a foil-wrap insulation barrier. 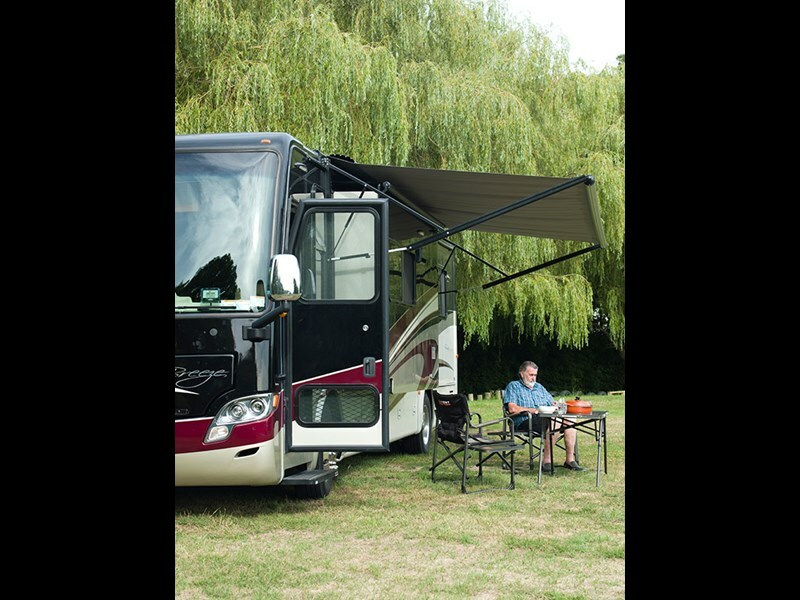 Exterior comforts include an Extraordinaire AC system, LED patio and door light with a slide-out awning and electric patio steps. 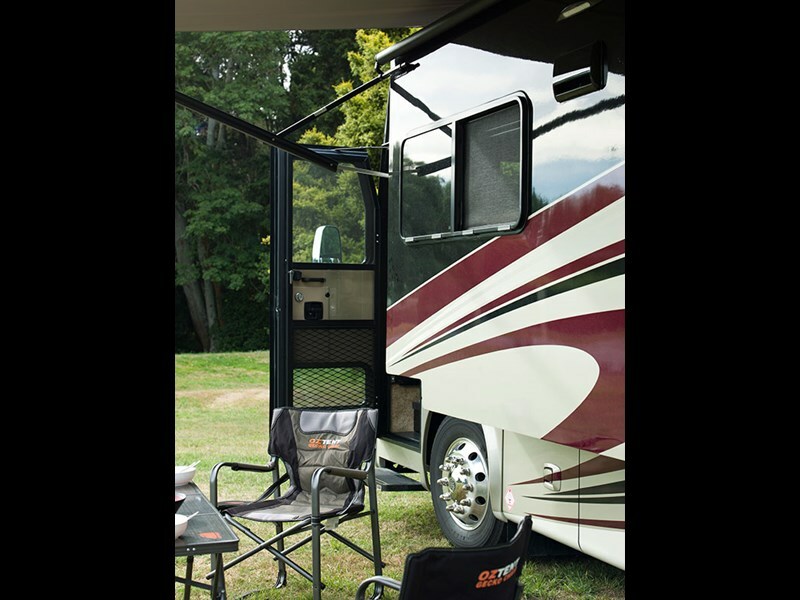 Exterior storage compartment lights and an outdoor hose and shower make supported outdoor living a breeze. Driving is also made extra pleasurable with thoughtful extras like the heated power mirrors and side-view cameras activated by turn signals. Water intrusion will be a challenge for this well-constructed vehicle with one-piece, moisture resistant moulded fibreglass roof cap which also provides insulation and strength. This vehicle is converted to right-hand drive steering. It features an Allison six-speed automatic transmission with lock-up; air ride suspension, together with independent front suspension; exhaust brake and full air brakes; a PowerGlide rear engine diesel chassis with Navistar and MaxxForce seven-engine with a peak of 240 horsepower at 2600 RPM. Power is supported by two 200W solar panels (or equivalent) and four 6v 260 amp-hour maintenance-free deep cycle house batteries and Victron 3kw inverter 120-amp battery charger unit and a 4.8kw Onan Genset. Step up to the comfort of the Allegro cab with its power halo leatherette driver and passenger seats, lighted instrument panel set into the contemporary-styled dashboard. Enjoy the superior comforts of the single CD player and AM/FM stereo. The back-up monitor system and dash gauges comes with its own diagnostic system and dual dashboard fans. 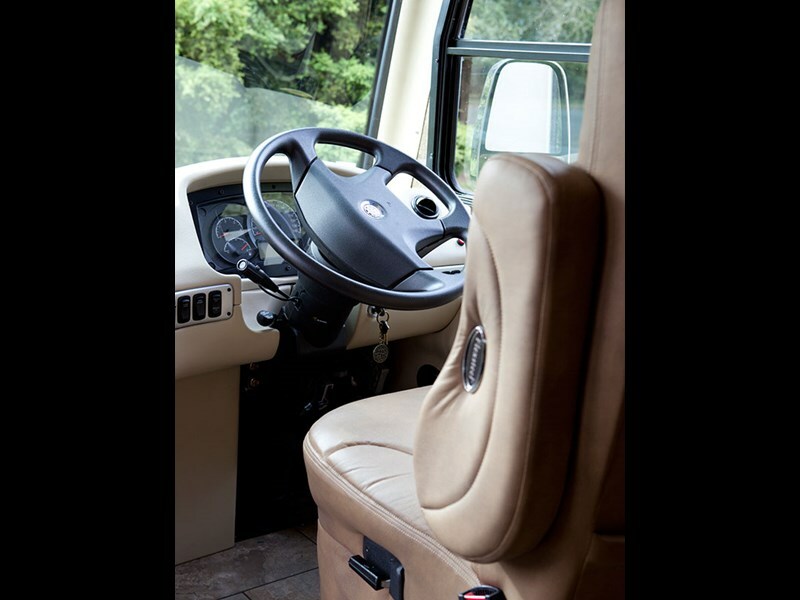 Further comforts include adjustable gas and brake pedals; a snack tray with two cup-holders; power solar/privacy windshield shades with manual solar/privacy shades on side windows; and an all-important fire extinguisher. For more information, phone (07) 574 9614 or email usadirect@ xtra.co.nz (without the space).